Mmm, burgers. I got a copy of the latest Jamie magazine and it had a great picture on the front – it was so good I had to try it. 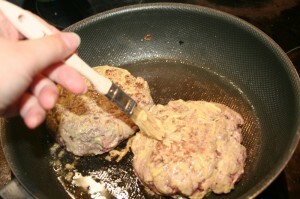 The burger pattie was very easy – mix salt and pepper into high quality beef mince, shape into a pattie and sear in a frying pan. However after searing the first side, I was to brush mustard over the second side before turning, and then add mustard to the first side. The magazine explained that the mustard would give a nice coating with lots of flavour – and it was so right. After cooking these large patties through, I put them onto a toasted bun with bacon, aioli, cheese and some fried onions. Then I added a little water to the frying pan, put in a trivet, and then put the completed burgers on this to steam, with a bowl over the pan. 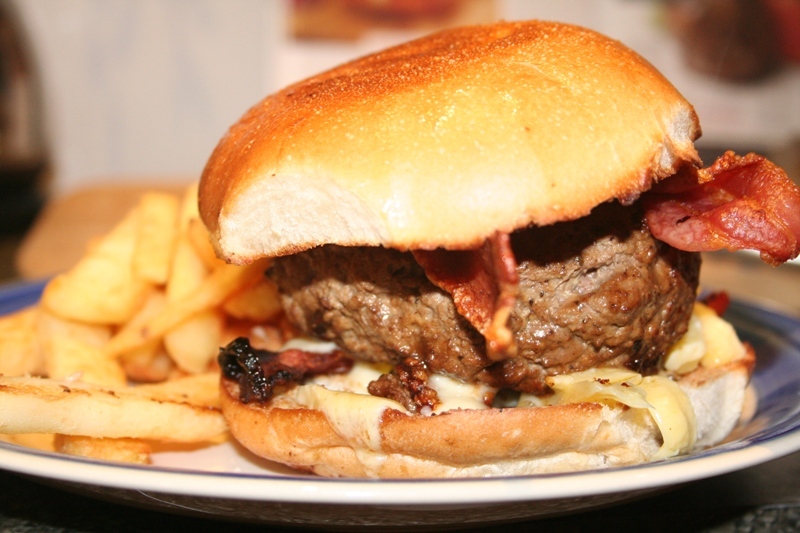 This allowed the buns to soften with the flavoured steam, the cheese to melt and some flavour to develop. I served with some fries and aioli, but the burgers were so big we didn’t manage to finish them. Note to self for next time: make smaller burgers!